One of the oldest electronic devices used in automotive vehicles by far, is the CB radio. Today, they are still being used by countless drivers from all walks of life. You name it, law enforcement, paramedics, firefighters, truck drivers, people like you and I, and many more others. The invention of a smartphone has definitely put a strain on the demand when it comes to CB radios.. however CB radios will most likely me used for a long time to come primarily because they are EXCELLENT for local communication. What we designed this guide to do, is help you find the best cb radio for your particular situation. Although we’re not sure exactly what you may need to use it for, the cb radio reviews below (in our top 7 list) will help you decide if one of these is what you’d be looking to use. Now before we dive deep, it’s important to note that these CB radios are what you can purchase as a common consumer right from the internet. Nothing out of reason in terms of price, both the regular and portable cb radios are rated highly for their functionality, price, and practicality. Cobra is known for their wide range of electronics that are 100% centered towards the driver. With that being said, it’s very clear that their CB radios are pretty darn good quality electronics. Our #7 contestant is the Cobra 18WXSTII Mobile CB Radio. This particular unit is nothing fancy in terms of technology, but it does what it’s supposed to do quite well. It features 40 full CB channels, 10 NOAA weather channels, an easy to extend 9 foot microphone, and a compact design. By compact, we mean 7″ inches long, 6.5″ inches deep, and 1.9″ inches high. The speaker from which you’ll hear everything from is mounted in the front, giving you a clearer reception. Along with the various dials on the front, you’ll be able to tell the signal strength using the led indicators located on the front panel. If a cost effective and small unit is what you’re looking for, the Cobra 18WXSTII could be the answer. Check it out! Here comes an even small unit than Cobra’s 18WXSTII CB. The Midland 1001Z a basic and compact package featuring approximately 40 full CB channels. From this particular CB radio you’re going to have instance channel 9 access, as well as a 4 watt output of power to give you the most range this unit can provide. At first glance it seems like the front has a WHOLE BUNCH going on, and that’s because its true. You’ll have the volume control CB/PA switch to allow you to use as a Public Address System (when paired up with a PA speakers), you’ll have the RF gain to adjust reception sensitivity, squelch control and you’ll also have the on/off knob. No fancy LCD screens, but instead a basic design led signal strength indicator. The extension cord for the microphone accompanies this small portable cb radio unit, perfectly. The cheapest unit on our list, great if you want a beginner styled citizen band radio. On the display, the bars indicate the strength of receiving reception. A nicer version of the Midland model mentioned above, we have the Uniden PRO505XL. 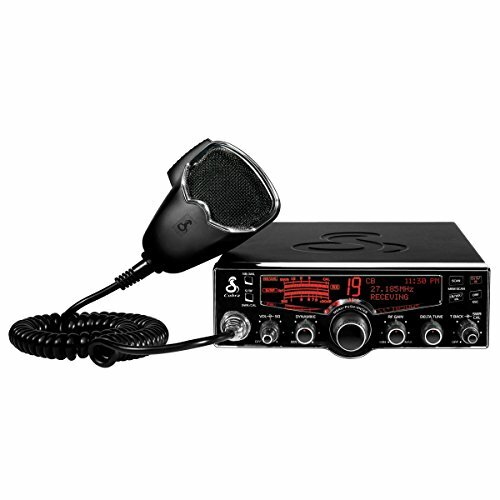 This CB radio is the exact same price and size for the most part, the only differentiating factor would be the LCD display showing you the selected channel and signal strength. Now with that being said, this is a very popular model due the affordability and compactness it presents. Right away, from the front you’ll have a few essential controls such as on/off knob, volume, squelch control, CB/PA switch, instant channel 9 button, and the ability to scroll up or down through the included 40 channels. With the stretchable microphone, you’ll have plenty of wire to have the microphone reach you. Its small size makes it perfect to fit into tight spots in any vehicle you could think of. Get an external PA speaker to make it a complete package. With this unit we’re going to really step it up in terms of functionality. 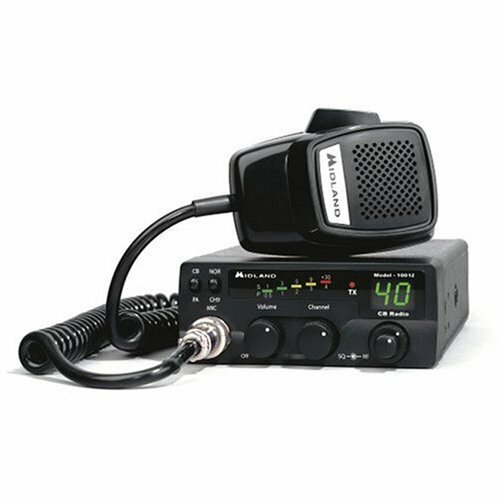 Unlike the above mentioned, minimalism units, we have have here a CB radio that has a plethora of features that will come in handy. Our #4 contestant is the Cobra 29 LX CB Radio with 40 full channels. 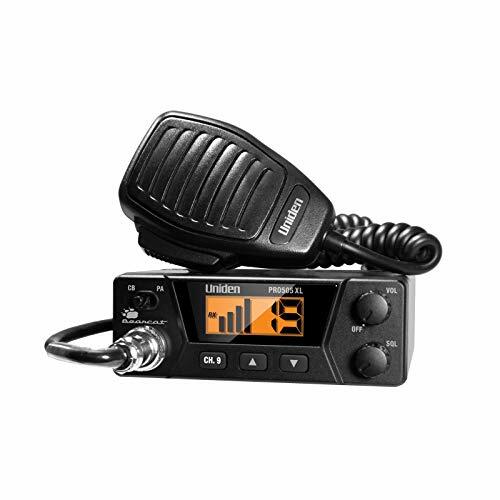 For a higher tech CB radio unit that gives you almost everything under the sun as a functionality, the 29 LX may be a good option. Lets dive into some of its features. First off the entire front display (including buttons) you can change the background color from red, blue, orange, and green. You have access to 10 NOAA weather channels with immediate emergency alerts, you can control the amount of talk back present during transmission, memory channel allows you to store up to 10 of the most frequently used channels for quick access, clock, timer, and even alarm which are handy for professional drivers, PA system compatibility, a 4 watt AM RF power output, and instant channel 9 and 19. More than 450 individual users have rated this Cobra model a 4.5 of 5.0. Check it out! 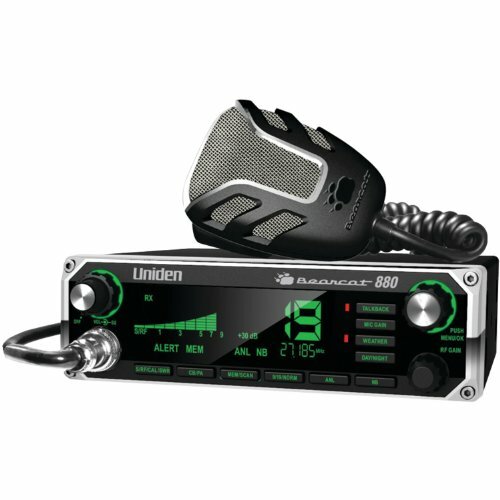 Taking a very modern look with the new styling, we have our #3 as Uniden BEARCAT 880 CB Radio. This is the type of CB radio that fits in with any single din head unit in terms of styling. We picked this guy as our #4 because it’s fairly priced, relatively compact in size, looks sharp, and has quite a few features. First and foremost, this is a 40 channel radio that features 9 and 19 instant channel access. Get access to NOAA Weather alerts, radio diagnostics, and a public address feature. With the beautifully illuminated control panel, you’ll be able to easily read what each button displays. There’s CB/PA switch, wireless microphone compatible, included noise canceling microphone, squelch control, talk back mic gain, memory channel scan, RF gain and volume with an on/off switch. Nice and clean deign, not looking out of place anywhere, especially under 100 dollars. With a beautiful silver and baby blue back-lit color scheme, the Uniden PC787 Bearcat takes our #2 spot. This radio in particular is just 75 dollars and boasts quite a few nice features. For starters, you get a clean layout on the front showing you exactly what each button and knob does with a back lit blue color. Important features like an integrated SWR meter (which also helps you to match your antenna perfectly), mic and RF gain, instant weather alerts, noise blanker, automatic noise limiter, instant channel 9 & 19 access, and lastly there’s 40 full CB channels. The extra large displays on both ends allow you to easily see the signal strength you’re receiving, and also which channel you’d like to select. Bottom buttons allow you to adjust the squelch volume, tone volume, microphone gain, and most importantly the main volume (which has an integrated on/off switch). This unit luckily is also compatible with a wireless microphone for up to 100 yards! 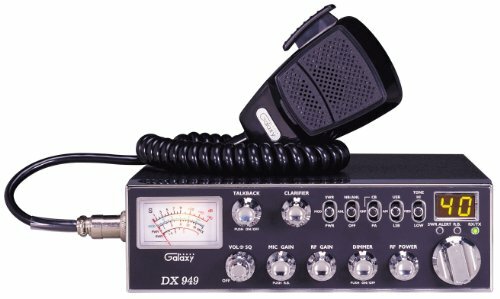 Coming in as our #1 best cb radio out of the top 6 list is the Galaxy DX-949 AM/SSB Mobile CB Radio. 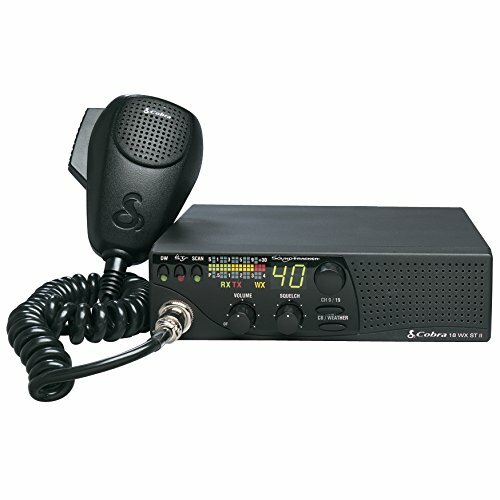 For starters, this is a professional grade CB radio unit. Not the sleekest look and design, it’s created specifically for professional drivers in mind (not amateurs). A large meter is located on the left to tell you the strength of the receiving signal, modulation and SWR. A digital display is located on the right to indicate the variable power output, and selected channel. Other included switches and knobs are: variable volume squelch control, microphone gain, RF gain, dimmer (with an on/off switch), RF power, and a master switch for SWR Alerts, R.B., and RX/TX. Proprietary Galaxy Noise Filter reduces noise when in recovery of weak SSB signals. Overall it’s quite heavy and large, some space is definitely required to properly get a fitment. To see more details and why average reviews give it a 4.5+ star rating, click the Amazon button. Additional guides you may find interesting are our car battery buyers guide and, the satellite radio buyers guide. For all electric appliances hooked up to your vehicle, you need a good car battery to support everything. Here’s how to operate a CB radio..